Lessons we learnt the hard way: The bluestone church arts venue is not exactly on the corner of Napier and Hyde… It’s about 200 meters south of the intersection, on Hyde St. If you’re standing on the corner, wondering where the church is, just look for the big council building, and walk past it. I promise you there’s a church, with beanbags and ambient lighting and mulled wine and minimalist music, waiting, just for you. Rosie’s interest in music began at age six when she started learning the piano. Through primary school she dreamt of playing the French horn and becoming a professional horn player, however, it wasn’t until high school that she was able to start lessons on the horn which quickly became her main instrument. Rosie has always had an interest in chamber music and more recently has been exploring the world of Jazz. She is a member of Shrewd Brass (Musica Viva in Schools group) which allows her to combine this passion for chamber music and jazz with her passion for music education. She has taught horn in various schools including her current schools Eltham High School (since 2006) and Huntingtower College (since 2010). Rosie has studied the horn under Geoff Lierse, Geoff Collinson, Russell Davis, Debra Hart and her first teacher Kate Burgess. As well as her initial Bachelor/honours degree in Music Performance (VCA) Rosie has completed Masters in Music Performance (Melbourne Uni) and also spent two years studying at the Australian National Academy of Music. It was during this time that she composed and performed her first piece written for voice, horn and piano. Rosie regularly performs in the Melbourne freelance scene which includes casual work with Orchestra Victoria and the Melbourne Symphony Orchestra as well as other various Melbourne ensembles, opera companies and in musicals such as Mary Poppins and Love Never Dies. Phoebe Green, a violist and curator, is a regular figure in the new music scene in Melbourne. A passionate advocate of Australian composers with a unique voice, she focuses on twentieth-century and current and exploratory repertoire. Phoebe has commissioned numerous works for viola and other instruments from various composers, including James Rushford, Helen Gifford, Alistair Noble, Lisa Illean, Wally Gunn and David Chisholm. As part of New Music Network’s 2014 Mini Series, Phoebe performed with percussionist Leah Scholes in a program celebrating works commissioned by Phoebe since 2005. She attended the 47th International Summer Course for New Music in Darmstadt, Germany, and was awarded a Stipendienpreis for Interpretation. Phoebe returned to Darmstadt in 2016 and was also part of the Australian delegation to Classical:NEXT in Rotterdam. In 2015 Phoebe performed solos with Arcko Symphonic Project and ASTRA, presented a solo recital at BIFEM to great acclaim, was guest artist in residence with the Amplified Elephants and had a baby. Phoebe recently released a recording with Leah Scholes of her 2009 commission, The Arrival, composed by David Chisholm. Leah is passionate about imagination, delight, and pathos. Co-founder of The Sound Collectors (percussion duo) and The Flying Tapirs (theatrical-music duo), Leah has worked with Speak Percussion, Barking Spider Visual Theatre, Chunky Move, The National Institute of Circus Arts, Strange Fruit and Synergy Percussion, among others. She also performs regularly with Symphony Orchestras across Australia, New Zealand and Malaysia. Leah has studied internationally with both improviser Fritz Hauser in Switzerland, and master drummer Aly N’Diaye Rose in Senegal. In addition to her musical pursuits, she is also studying midwifery and nursing, and exploring the role of the arts within health care. Yvette Audain was born and raised in Auckland, New Zealand, where prior to her Australian arrival in January 2012, she had invested in a career as a busy, renowned musician and composer. Yvette, whose instruments are clarinet, saxophones, recorders and Irish whistles, has worked professionally in a variety of genres: classical (Auckland Philharmonia; New Zealand Opera), military band (the full-time Royal New Zealand Navy Band), Celtic-style originals (trio ‘Doris’), gypsy (the Benka Boradovsky Bordello Band), and many more situations in between. However, Yvette’s principal performance interest is early jazz. She has had the honour of leading the reed section of Brett’s New Internationals, New Zealand’s only authentic 1920s dance orchestra, developing her stylistic knowledge through transcribing and learning by ear solos by such masters as Johnny Hodges and Coleman Hawkins. Yvette subsequently went on to lead a smaller ensemble affiliated to ‘APOPS’, the Auckland Philharmonia (APO) education programme, performing to school audiences around the Auckland region. So far in Melbourne, Yvette has become a member of the all-female Dixieland jazz band Frilly Knickers, and is in the process of forming her own smaller jazz ensembles and duos. Yvette enjoys a productive, ever-rewarding career as a composer – a recent achievement in this area includes having her work ‘Eulogy’ read and recorded by the APO in their 2010 Graduate Composer Workshop. 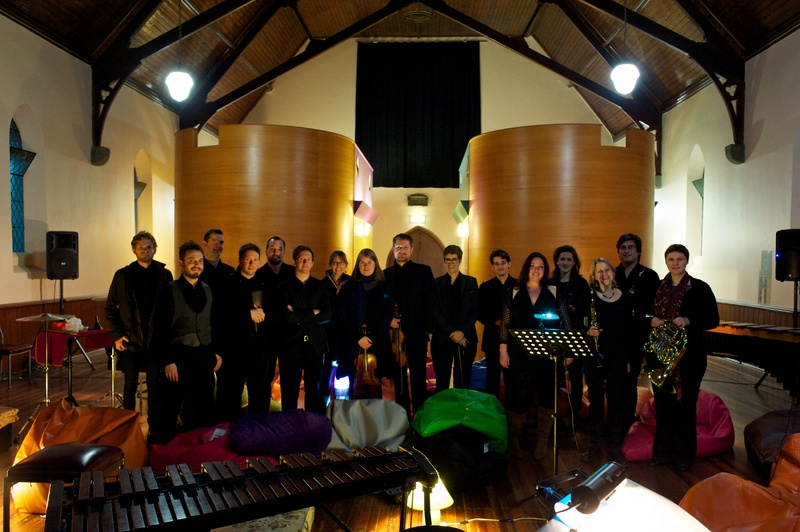 The work was programmed in the APO concert ‘Works With Words’ in association with the 2011 Readers and Writers’ Festival. Since 2008 she has been a member of the APO’s talented team of arrangers, and has had another commission ‘Felix the Cat: The Magic Bag’ (score for short cartoon film) performed by the APO Wind Quintet. March 2011 brought the impressively well-attended ‘Grooves Unspoken: Music by Yvette Audain’, a self-curated programme consisting entirely of Yvette’s own music, at St Lukes Church, Remuera, Auckland. This was in proud association with the 2011 Auckland Fringe Festival. Yvette holds a Bachelor of Music in composition and clarinet from the University of Auckland, and a Bachelor of Music (First Class Honours) in composition and ethnomusicology from Victoria University of Wellington, where she subsequently completed her Master of Music (with Merit) in composition. Nat Grant has been playing drumkit and percussion since she was 15, and completed a Bachelor and Masters of Music (Performance) at the Victorian College of the Arts (University of Melbourne). 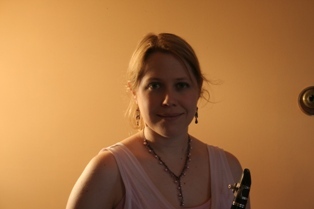 She has studied a variety of solo and ensemble repertoire and worked in the fields of improvisation, composition and inter-disciplinary collaboration.Since 2006 Nat has devised, performed and recorded her own music both in Australia and overseas, creating original musical works alongside other artists and in her own right. Nat has toured the US twice as a solo performer, and has subsequently developed creative relationships with several other artists and educators. Her online collaboration with Californian bass player Steve Uccello has resulted in two completed recording projects and, in 2011, several US performances and a television appearance. 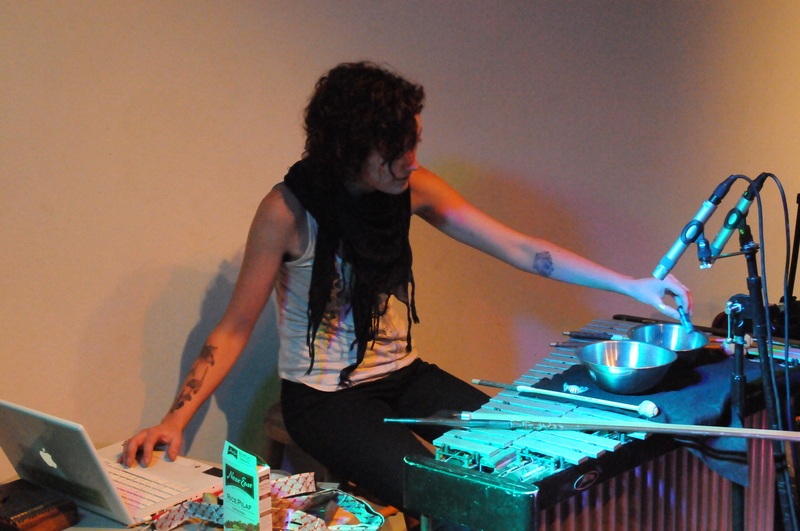 In 2011 Natpresented a clinic at PASIC in Indianapolis on live looping and digital processing as performance and compositional tools for percussionists.Nat has developed her own performances to incorporate acoustic and semi-acoustic percussion instruments, loops and various forms of digital manipulation. Her music explores intersections between acoustic and electronic environments, and between composition and improvisation. She performs solo and in improvised ensembles, and has been employed as composer for new and independent theatre, puppetry, dance and film works. Laila Engle is a versatile performer who maintains a busy schedule working as a flautist, vocalist, educator and producer. Her extensive performance experience includes over a decade of service with Royal Australian Air Force alongside a wide range of freelance engagements with orchestras and ensembles such as Orchestra Victoria, Philharmonia Australia, Arcko Symphonic Ensemble, Astra, 3 Shades Black, Argonaut Ensemble, Press Play, the Consort of Melbourne and Inventi Ensemble. In 2015 she appeared in the Melbourne Festival in duet with percussionist Daniel Richardson, and she has a long-running duet project with guitarist Ken Murray. She appears on the Move, and Ars Publica record labels and her performances are regularly broadcast on ABC FM. A passionate advocate for contemporary classical music, Laila has performed in the premiere of over 50 new works. At 3MBS radio station, Laila was a presenter of the Australian Sounds program, assistant producer for the award winning series National Contemporary Landscapes, guest adjudicator on The Talent, and a regular performing artist on numerous live broadcasts.